ShoreTel & VOIP Phone Systems in Rochester, NY | Rel Comm Inc.
ShoreTel’s unique purpose-built distributed voice architecture forms the heart of our unified communications premise-based platform, allowing for its rich feature set and highly reliable distributed voice services. Along with IP PBX, contact center, and unified communications services, it scales with plug-and play ease across as many sites as needed. ShoreTel’s Voice Switches come in a variety of sizes to fit the needs of your business. Scalability of the ShoreTel solution is as simple as adding another Shoregear switch to your telephone network. All trunking connectivity (analog, PRI) is attached through one of these Shoregear switches or SIP trunking can be handed off Ethernet, directly from the carrier into your Shoregear switch. ShoreTel Unified Communications Platform core software delivers the tools that form your business communication system, including voice routing, automated attendant, advanced telephony features, unified messaging, call accounting and reporting, and powerful workgroup routing capabilities. Standard with every installation, these essential communication capabilities are fully integrated and ready to use from a variety of intuitive interfaces—from the IP phone to ShoreTel Communicator. Intelligence is distributed over a unique and modular architecture so IT staff can manage the system from anywhere on the network. The built-in administration software, ShoreTel Director, offers complete visibility into the system, which looks and behaves like a single, unified platform, and scales and grows with plug-and-play simplicity across as many sites, or countries, as needed. ShoreTel provides customers the choice to pick the implementation model that best suits their needs, offering ultimate flexibility via “mix-and-match” deployment options across our modular platform architecture. Customers can deploy our core software on ShoreTel purpose-built, solid-state appliances, or virtually on industry-standard servers, or combine both ShoreTel hardware and virtualized applications for “mix-and-match” delivery within the same system. ShoreTel Unified Communications Platform core software comprises a comprehensive range of powerful features that come standard and fully integrated. Reliable IP telephony delivered wherever and however you require. An essential set of telephony features connects individuals or groups of people when and as needed while the built-in least-cost routing helps you manage your communications costs. A simple check-box incorporates users into the system’s integrated auto-attendant. Callers that reach the auto-attendant can easily select a destination based on your custom configuration, or search the directory by name. This built-in suite of versatile, real-time client tools puts flexible features, telephony and IM control, and collaboration services at users’ fingertips. In one easy-to-use interface, ShoreTel Conferencing unifies Web conferencing, audio conferencing, desktop/application sharing, instant messaging (IM), online presentations, and multimedia recording. The system’s simplified management and exceptional reliability reduce costs and let organizations manage collaborative activities in-house. These services can be distributed across the system to provide a seamless experience for users regardless of their location. An easy-to-configure call center solution with call routing, announcements, scheduling, and basic reporting in a simple package designed to help informal groups become more efficient. Flexible service options can be set up in just seconds. ShoreTel System Software automatically keeps records of all the calls in the system. This allows you to produce reports, analyze traffic, and effectively manage the use of the system. With the system’s optional account codes feature, calls can be tracked to the project level enabling you to bill back for services. Whether simplifying day-to-day communications, streamlining the work of contact center agents and supervisors, or making it easier for mobile workers to stay in the loop, your ShoreTel Communicator call manager puts intuitive communication and collaboration tools at end users’ fingertips. Users can manage voice routing, voicemail, auto-attendant, conferencing, instant messaging, and basic automated call distribution (ACD) capabilities for every site in the network. This eliminates the need for multiple management systems for different PBXs, sites, and basic applications.Extremely easy to learn and use, ShoreTel Director helps to improve administrator productivity, lowers ownership costs, and reduces strain on IT resources. Administrators can set up a user with integrated conferencing and instant messaging services simply by clicking on the user’s page. Searchable online documentation provides quick and easy answers. All admin and user guides are inherent to the ShoreTel Director Software interface. Upon upgrading your software level, these documents are also updated. No more searching the internet or trying to get these documents from your vendor. Pre-built integration of enterprise and CRM applications (such as Salesforce), calendaring, and workflow, raises the bar on customer interaction by putting data where it’s most needed. ShoreTel Communicator can also integrate with third-party information and applications via a rich set of application programming interfaces (APIs). ShoreTel Collaboration helps organizations gain a competitive edge by putting powerful and intuitive tools – such as audio conferencing, instant messaging, and desktop sharing – directly in the hands of the workforce. Without IT supervision or assistance, users enjoy the freedom to schedule, participate in, and record their conferences and collaboration sessions. And by offering support for multiple devices, ShoreTel Collaboration gives end users the freedom to choose how best to participate – by phone, desktop PC, smartphone, or tablet. Conferencing and collaboration software is integrated within the ShoreTel Service Appliance. Once the appliance is connected to the VoIP network, the system automatically recognizes and configures it, making conferencing and collaboration services available to end users within minutes. For users of Apple iOS devices, ShoreTel Mobility supports ShoreTel Collaboration, giving them access to instant messaging, audio conferencing and desktop-sharing. Click in a smartphone or tablet into the ShoreTel Dock, and you’ve got everything you need to participate in conferencing sessions – including a speakerphone and handset. ShoreTel Conferencing enables participants, whether they are PC, Mac, or Apple iOS users, to collaborate on documents and presentations in real-time. With a simple click on a web link – and no download – attendees can see the shared desktop within seconds. Users can invite participants to dial into the conference in a single step, and internal users can access the audio service simply by pressing the conference button on their phone. Other options allow participants be dialed in directly, or to request a callback. ShoreTel Conferencing offers support for wide-band codecs, providing a higher level of listening comfort, making everyone – regardless of their location – feel more immersed in, and closer to, the conversation. The Instant Recording feature gives users options for storage and simplifies distribution of the recording of the conference and its accompanying Web presentation. ShoreTel Mobility Client for mobile devices is designed to extend unified communications (UC) applications to a wide range of smartphone and tablet operating systems. End-users can enjoy enterprise deskphone features such as extension dialing, call transfer and directory query on their smartphones. Unified communications features such as peer-to-peer video, room-based video conferencing, web conferencing and desktop sharing enhance productivity through collaboration. Users can make and receive calls while the best network available (Wi-Fi, 3G/4G or cellular) is automatically selected. Fast and automatic network handover helps call continuity across networks, and slashes mobile costs by moving calls to Wi-Fi when available. The ShoreTel Mobility Client optimizes communications algorithms to reduce data and battery usage on mobile devices—all through an application that remains transparent to the end-user and keeps connectivity on the go brilliantly simple. Easy for users to install and activate in seconds, the intuitive user interface provides a powerful yet lightweight way to stay connected and collaborate effectively, driving productivity and improving responsiveness. Click in your smartphone or tablet into the ShoreTel Dock, and you’ve got the power of a desk phone – including speakerphone, handset and keypad. Customers expect higher levels of service than ever, and multisite contact centers are now the norm. Built on the highly reliable voice capabilities of our on-premise unified communications system, ShoreTel’s Enterprise Contact Center solution easily connects internal and external customers to the right agent at the right time. The result? Lowered costs and an improved customer experience that transforms your contact center into a revenue center. ShoreTel offers flexible solutions – from smaller, less formal environments to large organizations requiring multimedia, sophisticated routing, enhanced reporting options, self-service and outbound campaign capabilities. ShoreTel’s best-of-breed approach for supporting the leading CRM and enterprise management applications enables organizations to deploy a complete, integrated contact center solution that meets unique and changing business requirements. ShoreTel is the only UC provider to offer a choice of communication solutions and endpoints that optimizes how users communicate in the work environment for maximum productivity by providing the best possible user experience. Whether a customer communicates with desk phones, smart phones, tablets, laptops or PCs, ShoreTel enables them to choose the device best suited to their needs. Building on ShoreTel’s line of brilliantly simple IP phones, the ShoreTel 400 Series IP phones incorporate the latest user feedback giving customers the advantage of feature rich business phones that provide new functionality and enhanced usability. 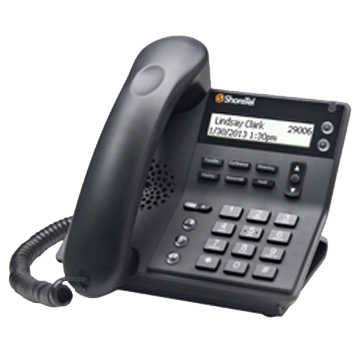 Several 400 Series IP phones are available for our ShoreTel Sky service. The ShoreTel Dock, when combined with the ShoreTel Mobility Client, extends Unified Communications applications including voice, location-aware presence and instant messaging to mobile devices securely and enabled users to utilize their smartphone or tablet as the primary communications device. ShoreTel phone solutions are for any customers who are looking to add to their existing premises solution, install a new system, or to add a cloud solution. ShoreTel provides a flexible platform for growth by providing a leading edge UC premises based system now with capability to add cloud services later. The single-line IP 420 is a cost-effective telephone ideal for open areas, including lobbies, classrooms and dorm rooms. The IP 420 has 2 lines, half duplex speakerphone and an integrated Ethernet switch, allowing a network drop to be shared with a desktop PC. 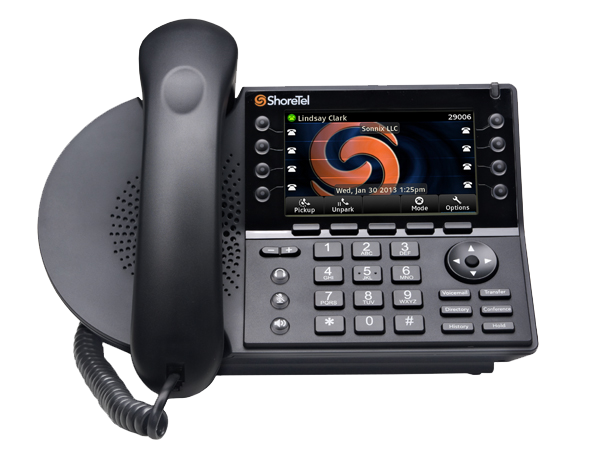 ShoreTel’s advanced phone, the IP 480 provides 8 line appearances, expanded call history, visual voice mail and an integrated 10/100 Ethernet switch, allowing a network drop to be shared with a desktop PC. ShoreTel’s advanced phone, the IP 480g provides 8 line appearances, expanded call history, visual voicemail and an integrated 10/100/1000 Ethernet switch, allowing a network drop to be shared with a desktop PC. 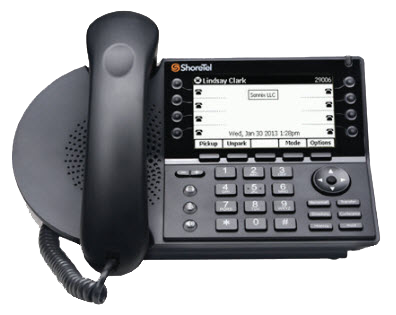 ShoreTel’s most advanced telephone, the IP 655 provides 12-line appearances with a large backlit touch color display. Advanced microphone technology delivers superb speakerphone capability for offices and small and midsize conference rooms when used with the optional extension microphone accessories. 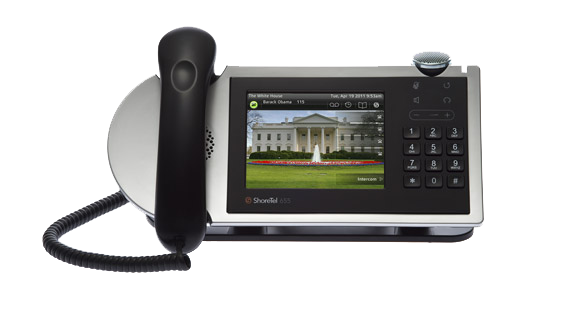 The ShoreTel Dock is the first and only business-grade device that transforms the Apple® iPhone®, iPad® and iPad mini into the desk phone for the mobile generation. The ShoreTel Dock merges the benefits of a desk phone (audio quality, always-on power and ergonomic comfort) with the unified communications power of ShoreTel Mobility– instant messaging, directories, buddy presence, extension dialing, web conferencing and more. There are two models of the ShoreTel Dock available with either an Apple 30 pin connector or an Apple Lightning connector. Each model has an articulating arm that lets users rotate their iPad between portrait and landscape orientations making web browsing as easy as placing a phone call. It works with both Bluetooth and direct connectivity and delivers the best audio quality possible—all while keeping the device charged and ready to go. The ShoreTel IP Phone BB24 programmable button box provides operators and assistants with at-a-glance presence information and fast, one-button feature access. The 24 buttons can be customized to suit the needs of different users. Self-labeling keys eliminate paper labels, saving time while ensuring the accuracy of configuration. The only IP-based device on the market, the BB24 includes an Ethernet switch and provides PoE power forwarding for one downstream device. Up to four devices can be associated with an IP Phone. Rel Comm Inc. is proud to keep communities throughout Western and Central New York connected. For more information about our other solutions please contact us by calling 1-888-394-6703!